Your comfort is our priority at The Sefton. The hotel is easily accessed via ramps leading from the underground car park and convenient ramps at the promenade reception entrance. There are internal ramps and elevator services, making wheelchair access straightforward. The Sefton has three accessible rooms, each situated on the first floor with an accompanying balcony view of the Atrium Water Garden. 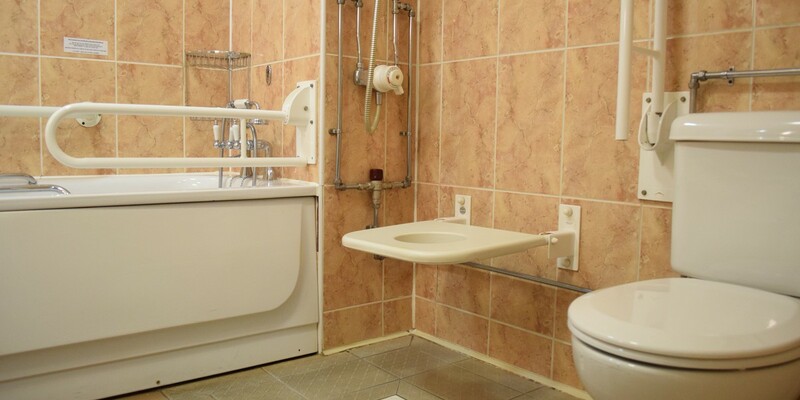 With en-suite facilities, an Accessible room features a standard bath with lowered sides and wheel-in shower, with added amenities for your convenience, including handrails by the toilet, low-level sinks and easy to reach towel rails. The Breakfast Room is located on the first floor and has level access and a ramp gives access to Harbor Lights Restaurant and Sir Norman’s Bar. There is a special lowered section at the reception desk for easy registration and communication with reception staff and there is disabled toilet facility on the ground floor and first floor immediately adjacent to the main lift. The edge of the swimming pool is accessible by wheelchair but the changing rooms are not, therefore we advise you to change in your room before coming down to the pool. Dressing gowns can be brought to your room upon request. There are two disabled parking spaces in the hotel’s underground car park. When first arriving by car, go straight round to the rear of the hotel and drive down the ramp into the car park. Please do not hesitate to get in touch with us for more information about how we can assist you during your stay. Call our Central Reservations team +44 (0) 1624 697070 for further information on this room type, or to assist with your booking.